Nausea is that uneasy feeling in the stomach that may make a person want to vomit. Vomiting is the act of throwing up stomach contents through the mouth. Having a condition or disease that can cause nausea or vomiting is a risk factor. In some cases, you may have other symptoms in addition to nausea and vomiting. How long have you felt nauseous? How long has the vomiting occurred? Does the vomiting happen near mealtime? Have you had any injuries to your head? How often have you been urinating? Vomiting may cause dehydration and low urine output. A physical exam will be done. 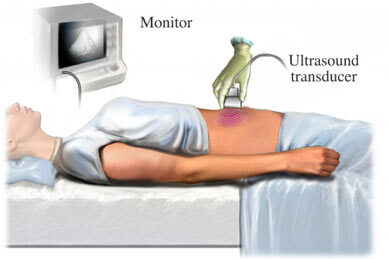 The doctor uses a hand-held instrument called a transducer, which uses sound waves to make images of your abdomen. In some cases, you may be able to manage nausea and vomiting at home. Drink clear liquids such as water, juice, or broth. Eat light foods that do not further upset your stomach. Eat foods from all the food groups as much as you are able. This will ensure that you get proper nutrition. Slowly build your way up to drinking larger amounts of clear liquids such as water, juice, or broth. Do not eat solid foods until vomiting has passed. Do not stop taking your medications unless advised by your doctor. Vomiting may cause you to become dehydrated. You may need to drink an oral rehydrating solution (ORS) if vomiting makes it difficult for you to stay properly hydrated. There may be times when symptoms will need to be treated by your doctor. This may be the case if nausea and vomiting are caused by surgery, cancer therapy, pregnancy, or motion sickness. Your doctor may be able to prescribe medications to relieve the symptoms. Drink liquids between meals, instead of during meals. Always wash your hands before eating, and after using the bathroom and coming into contact with people who are sick. Make sure you properly handle food . Kuver R, Sheffield JV, McDonald GB. Nausea and vomiting. Division of Gastroenterology University of Washington website. Available at: http://www.uwgi.org/guidelines/Chapters/ch%5F01/ch01.htm. Accessed December 15, 2017. Nausea and vomiting. American College of Gastroenterology website. Available at: http://patients.gi.org/topics/nausea-and-vomiting. Accessed December 15, 2017. Nausea and vomiting. Family Doctor—American Academy of Family Physicians website. Available at: https://familydoctor.org/symptom/nausea-and-vomiting. Accessed December 15, 2017. Nausea and vomiting in adults. EBSCO DynaMed Plus website. Available at: http://www.dynamed.com/topics/dmp~AN~T900007/Nausea-and-vomiting-in-adults . Updated September 13, 2017. Accessed December 15, 2017.